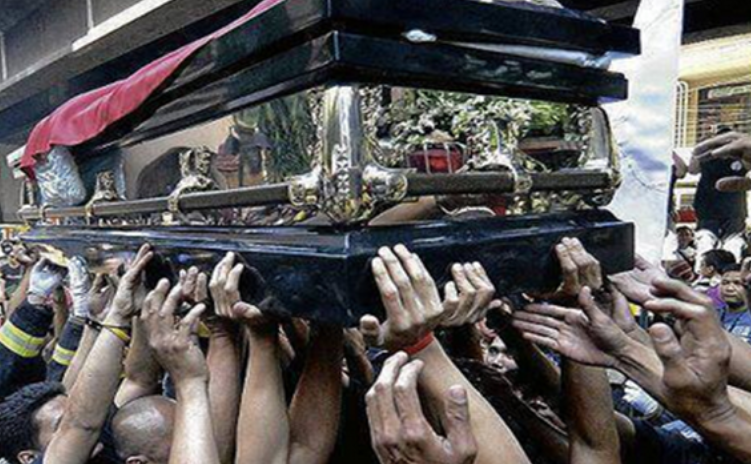 After She Died, People Couldn’t Carry Her Coffin, Later They Discovered Something! This is a story from University of the Philippines (Diliman) about a young college girl who passed away last month. Her name was Tiffany. She was hit by a dump truck. She had a boyfriend named Joel. Both of them were true lovers. They always hung on the phone. You could never see her without her cell phone. In fact, she also changed her network coverage from Smart to Globe, so both of them can be on the same network, and save on the cost and get good network coverage. She spends half of the day talking/texting with Joel. Tiffany’s family knew about their relationship. Joel was very close with Tiffany’s family. (Just imagine their love). Before she passed away she always told her friends “If I pass Away please bury me with my hand phone” she also said the same thing to her parents. After her death, people couldn’t carry her coffin, I was there. A lot of them tried to do so but still couldn’t, everybody including me had tried to carry the coffin, the result is still the same. Eventually, they called a Feng Shui Master. He took a stick and started speaking to himself slowly. After a few minutes, he said: “THIS GIRL MISSES SOMETHING HERE”. Then her friends told the Master about her intentions to bury her with her phone. He then opened the coffin and placed her phone and SIM card inside the casket. After that, they tried to carry the coffin. It could be moved and they carried it into the van easily. All of us were shocked. Tiffany’s parents did not inform Joel that Tiffany had passed away. After 2 weeks Joel called Tiffany’s mom and said, “I’m coming home today. Cook something nice po, ha? Don’t tell Tiffany that I’m coming home today, I wanna surprise her. After he came, they told him the truth about Tiffany. Joel thought that they were playing a fool. He was laughing and said “don’t try to fool me – tell Tiffany to come out, I have a gift for her. Please stop this nonsense”. Then they showed him her grave. Joel said, “It’s not true. We spoke yesterday. She still calls me.” Joel was shaking. Suddenly, his phone rang. “See.. this is from Tiffany, see this…” he showed the phone to Tiffany’s family. All of them told him to answer. He talked using the loudspeaker mode. All of them heard their conversation. Loud and clear, no cross lines, no humming. It was the actual voice of Tiffany & there was no way others could use her SIM card since it was nailed inside the coffin. They were so shocked and asked for the Feng Shui Master’s help again. GLOBE HAS THE BEST COVERAGE, WHEREVER YOU GO, THEIR NETWORK FOLLOWS…ANG LAKAS TALAGA NG GLOBE. KAHIT NASAAN KA MAN. KAHIT NASA PURGATORYO KA PA.KAYA GLOBE NA KAYO NANG KAYO AY NAKAKASIGURADONG MALAYO ANG MARARATING NINYO!! !